Two excellent weeks of birding from Monterey to the Sierras to San Diego with 14 excellent Swedes! We started our adventure on Friday, with a boat trip to Santa Cruz Island. Multiple Black-vented Shearwaters surrounded our boat at times, and we also spotted Pomarine and Parasitic Jaegers. 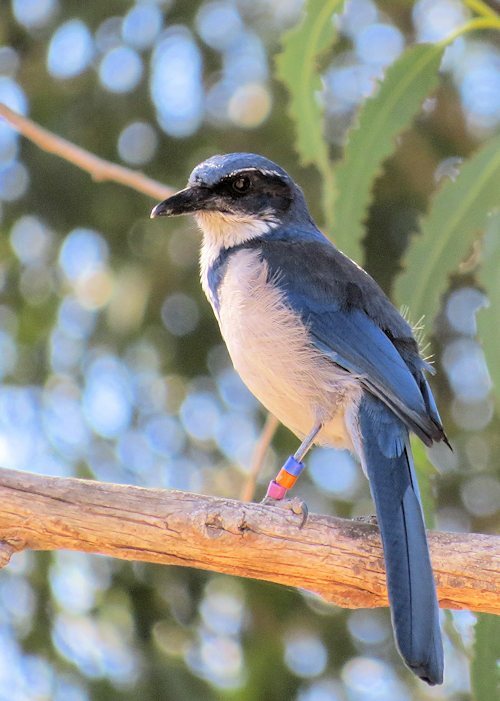 On the island we had the Island Scrub-Jay before long, along with many other great birds. Even rarer than the jays were two vagrant Tennessee Warblers! 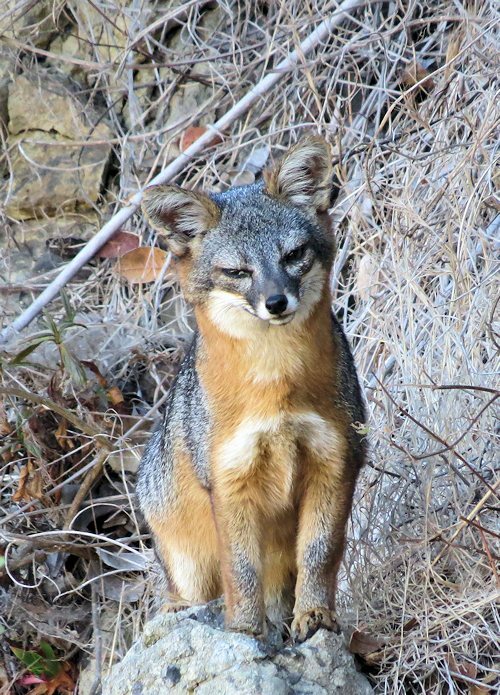 Of great interest to all were the four Island Foxes, a species descended from the Gray Fox on the mainland. The next morning we went to a migrant trap (Laguna Road) and located a Yellow-green Warbler and an American Redstart among the dozens of western migrants. It was an awesome opportunity for the Swedes to see almost all of the Western warblers in one single place. 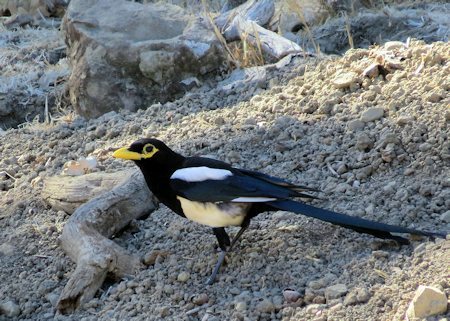 From there we headed north to try our luck with the Yellow-billed Magpie at Najoque County Park. No magpies there, but we did get Hairy, Downy, Ladder-backed Woodpeckers for our troubles. But on Alisail Road we struck gold at the fancy golf course, and everyone got top notch looks at the fancy bird. Morro Bay was our destination for the night, and we got to see many fine coastal birds as we made our way north. We spent an hour before breakfast at the Elfin Forest in Morroy Bay, where Wrentits, California Thrasher, and California Towhees all proved cooperative. 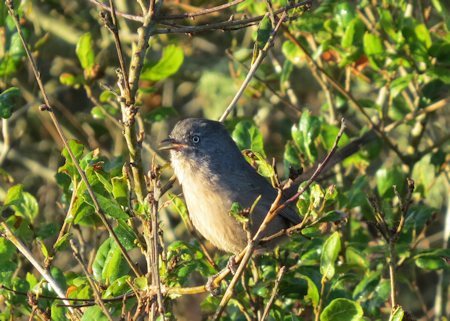 Lot of us finally got good photos of the Wrentit, heretofore just a voice in the chaparral. 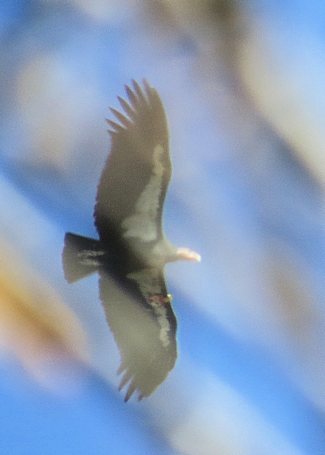 At Julia Pfeiffer Burns State Park we got good looks at two California Condors, one of our main targets. This bird (to the right) slipped behind a tree just as I fired off my photo. 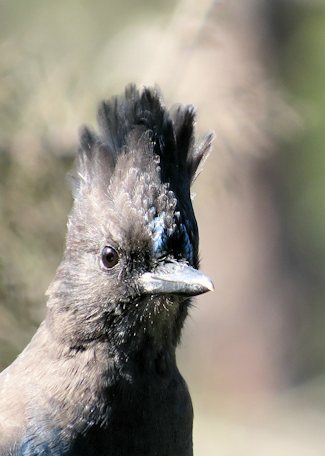 Also at this most productive spot was a flock of warblers and kinglets harassing a Northern Pygmy-Owl and a number of inquisitive (hungry) Steller's Jays. Another group of birds down the path included Hermit Warbler, Hutton's Vireo, Bushtits, and Chestnut-backed Chickadee. 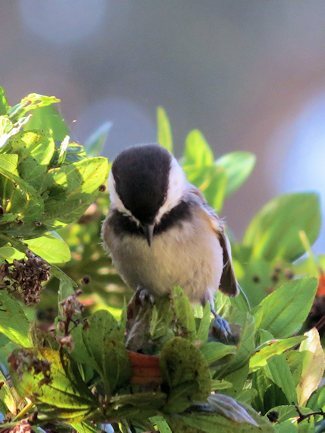 The chickadee on the right stayed in place long enough for a quick photo. I stayed on the mainland today while the Swedes went out on a pelagic under the watchful eye of Monterey Seabirds. The heavy swell was predicted to be 8-12 feet, more than my stomach could handle. So I scouted out birding spots for the late afternoon and the next day while my compatriots got Black-footed Albatros, Manx & Buller's Shearwater, and other excellent ocean wanderers. 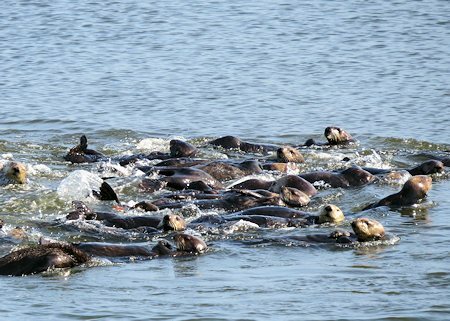 On the boat, everyone got stellar looks at humpback whales and sea otters; on the mainland I got to see a "flock" of 40 sea otters. We had planned to hike and bird in Pinnacles National Monument today, but the governmnet shutdown closed down the park. Instead, we birded the road, picking up a nice array of sparrows, inlcuding Rufous-crowned and Grasshopper. 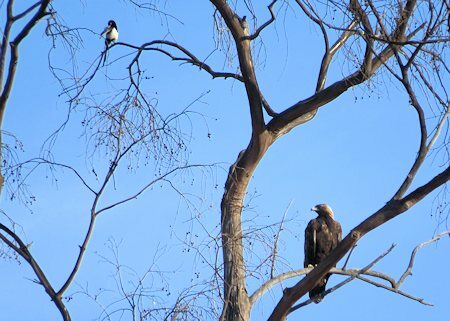 In this huge eucalyptus tree, a Golden Eagle dwarfed a near-by Yellow-billed Magpie. In the afternoon we drove on to the foothills of the Sierras, spending the night in Porterville. We drove up the long, winding road into the Sequoia National Forest, and watched our thermometer dip down into the 30's. At the Aspen Hill Campground we made our first long stop, and started adding forest birds right away. 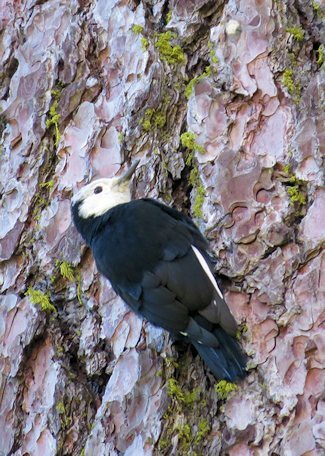 White-headed Woodpecker was a big hit, as were the nuthatches and Mountain Chickadees. 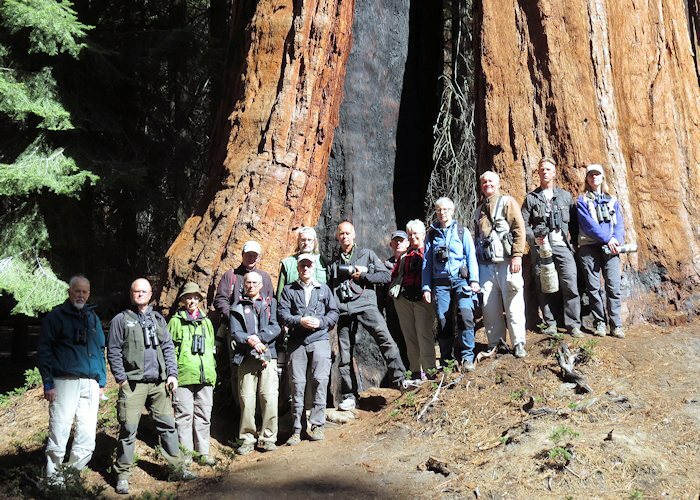 The Giant Sequoias were beautiful and impressive, and close to the Trail of 100 Giants the Swedes posed for a group phtos. Lunch was a picnic at the lovely Hovley Meadow, where we added more forest birds, and as we started our slow descent into the Kern Valley a male Mountain Quail ran across the road. 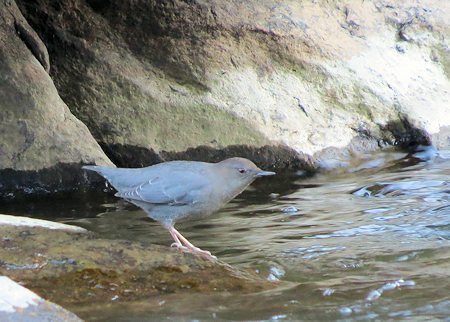 That afternoon, along the Kern River, we tracked down two more targets, this singing American Dipper and a Canyon Wren. 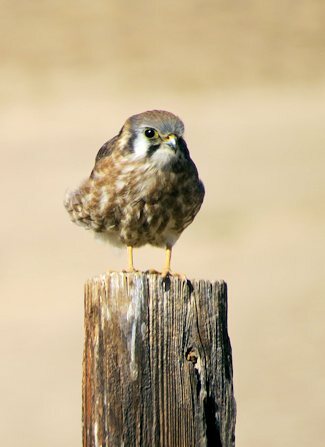 A full day of birding in the Kern Valley was quite productive. In the Kelso Valley we added a late Rufous Hummingbird, Rock Wren, Prairie Falcon, Vaux's Swift, and Ladder-backed Woodpecker. Later we also tracked down White-throated Swift, Sage Sparrow, Cactus Wren, and Clark's Grebe.